A situation analysis is a process in the marketing plan that is used to define and analyze an organization’s internal and external environment to clearly identifies the capabilities, customers, potential customers and the business analysis environment, as well as the impact that affects the organisation or the business analysis. The main purpose of conducting a situation analysis is to determine the strengths, weakness, opportunities, and threats to the business. Not only that, the situation analysis is also useful when defining the company, competitor, and the customer to determine the crucial steps that the business needs to take within the marketplace. Company – The evaluation of the company’s objectives strategies, and capabilities to determine its strengths and weaknesses. Competitors – Analyzing the competitor’s position in the market and the threats that may affect the business. Customers – Involves analyzing the demographics, geographics, and the behavior of the customer. Collaborators – They are useful for the business to as they allow for new business ideas and gaining new business opportunities. The SWOT Analysis. The SWOT analysis is very famous and one of the widely used tools in analyzing the business itself. This involves analyzing the strengths, weaknesses, opportunities, and the threats of the business. The process of this analysis involves looking at both current and future situations. Porter’s Five Forces Analysis. This analysis is the framework for industry analysis and business strategy development. On of its main function is to determine the competitive intensity of the business to attract the market. Analysis of trends. This develops a statistical picture of a community based on the currently available information. SWOT analysis. Analyse the internal and external factors of a business to determine the success of the marketing plan. Key informant interviews. The key informant interviews are conducted by selecting an individual to obtain feedback and different views about the issue. Focus group. This is also a process of an interview but done in a small group to have flexible and creative discussions. Network analysis. The network analysis is a process of linking organisations through individuals who have a position in the organisation. 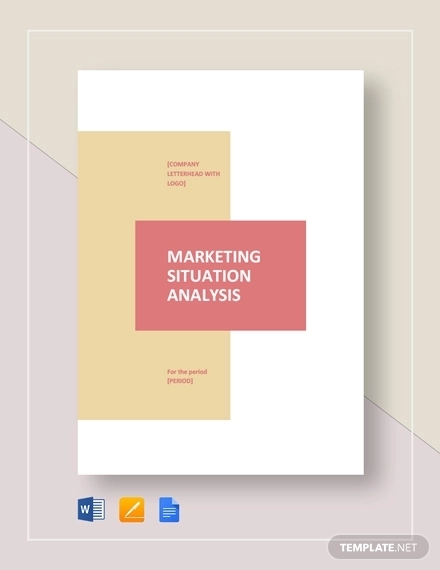 The American Marketing Association says that the situation analysis can be more effective and efficient when it includes an examination of the internal factors (the strengths and weakness) and the examination of the external factors (the opportunities and threats). This is what they called the SWOT analysis Example. Strengths. The factors that put the organization or the business into its success. Weaknesses. Anything that blocks or hinders a successful plan of the business. Opportunities. The factors that may influence your marketing plan’s success. Threats. The factors that might put the marketing and business activities analysis into an unwanted risk.